Again, this completely ignores how prejudice and oppression actually looks in our world. Look at religious movements that encourage large families and get really intense about squeezing out lots of young ‘uns. What’s the narrative? “They’re out breeding us!”. This is one of the cornerstones of the “quiverfull” movement - which espouses good Christian women to mass-produce children like they have to personally create their own sports teams (Where “they” can be Black people, Muslims, Latino immigrants, Catholics - there’s always a nebulous menacing “they” are winning the womb war). You can also do some googling and quickly see that “being outbred” is definitely a concern for vile racist organisations like Stormfront (no, I am not linking to that filth). You can see a similar narrative on Nazis-calling-themselves-AltRight sites as well. You can see articles in the Daily Mail (no, still no linking to filth) wringing their hands about Britain becoming Muslim and America reaching a “tipping point” where non-white people outnumber White people - something that continually buzzes the news as some kind of major, frightful event. The reaction of an oppressive, White Straight Male, religious patriarchal society to a fertility crisis is most certainly not going to be “let’s breed more Black/Latino/Asian babies!”. The womb wars are a very real thing among this movement - outbreeding the “other” is a campaign for them. These people are not going to see a declining birth rate and think “all of humanity is in peril, come people of all races unite in joint purpose to produce multi-racial babies by the score!”. They’re going to see a decline in White babies and panic. And just as that panic is, accurately, portrayed by Handmaid’s Tale as inflaming hatred and prejudice and exploitation against women and LGBT people led by the straight male elite, then equally it’s going to drive the same bigotry against POC by that same elite which is also White. Straight White Male Christian power rising to new heights and reducing everyone who isn’t one of the elite to a criminal or chattel is not going to draw a line at racism. It makes no logical sense that it ever would - it makes no sense that a panicked, power hungry, repressive authority is going to suddenly accept one of the most oppressed and persecuted groups in all history - a group that is very much hated by those people and forces today. The power of The Handmaid’s Tale is that this is our world - this is conceivably our world. This isn’t a dystopian caused by a magical virus, or a zombie outbreak or randomly deciding to divide the population according to random hallucination they have. This is a cautionary tale. This is a warning of the world that ours could become - this is a world where the prejudices we see espoused and championed today manage to gain power. This is a world where the rhetoric we are repeatedly hearing from religious leaders and politicians becomes reality. This is not an alien world - this is our world and it is all too possible. And this world isn’t - and Gilead would not be - a world where racism disappears. It is clear that there are good intentions in the casting here - and normally we would certainly be celebrating the inclusion of several Black characters. 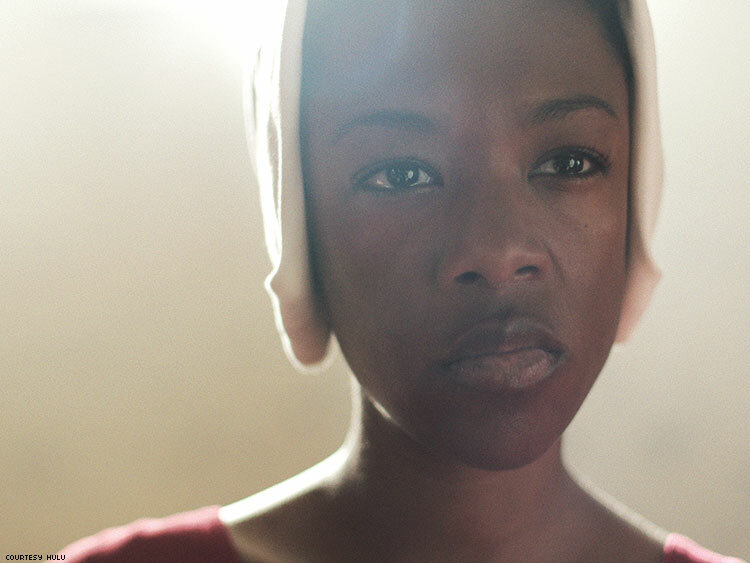 But there is a lack of nuance, a lack of examination and development and a very glaring omission that means even while Handmaid’s Tale has included Black and Asian characters, it has erased race, racial experience and racism.